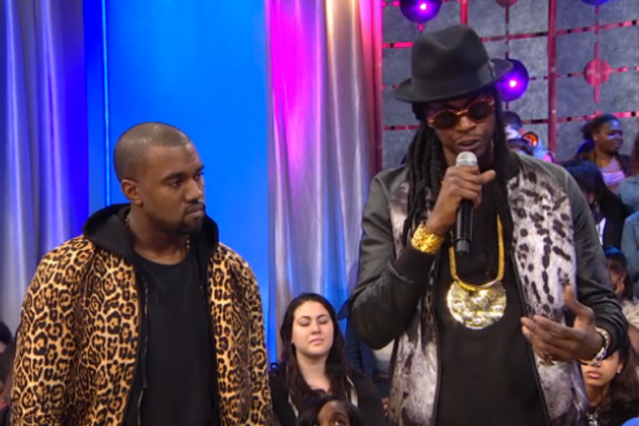 Kanye West stole the stage again last night on BET’s 106 & Park, but this time he did it without saying a word. A jewelry-bedecked 2 Chainz, who is currently riding a wave of high-profile collaborations including Nicki Minaj’s “Beez in the Trap” and West’s G.O.O.D. Music track “Mercy,” came on the show to offer up some humble bromides about hard work and prayer before calling Yeezy to the stage as a surprise guest. Wearing some kind of leopard print hoodie get-up (you’ll have to ask our fashion blog), along with his own Nike shoes, West flashed a few smiles but mostly just stood there straight-faced, nodding occasionally. “I just feel like I’m blessed,” 2 Chainz said of his collaboration with West. The Atlanta rapper and former Playaz Circle member is scheduled to release his first album for Def Jam, Based on a T.R.U. Story, on August 14. Kanye, if you want us to buy it, just stand there and do nothing. OK, message received.